I miss a lot of superhero movies these days. How could you possibly not? But I was genuinely excited about the offbeat and obscure Guardians of the Galaxy. Unfortunately, it ends up mostly being a cheap knock-off of Star Wars (which is certainly better than a cheap knock-off of most things). Root is a mix of Chewbacca and C3PO. Peter Quill aka Star-Lord is a mix of Luke Skywalker and Han Solo. Zamora is Princess Leia. I don't know what the raccoon Rocket is. And Drax is the Thing meets Arnold Schwarzenegger. Quill (played by the always-likable Chris Pratt) is the only one who really gets a backstory. His mother dies back on Earth and he didn't give her a proper goodbye. After aliens abduct him, the only thing he has to hold on to his Earth family with is a Walkman with the songs of the 70s that his mom loved, like "Hooked On a Feeling" and "Come and Get Your Love." The soundtrack, needless to say, is one of the best things about the film. The humor works most of the time and the bad guys are also a hoot to watch, especially the Star Wars-like Ronan and blue-skinned Yondu. 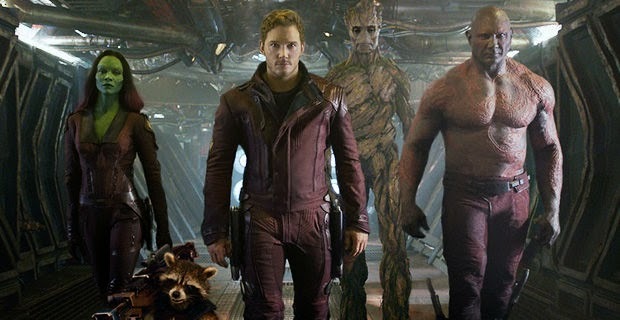 The backstory on the characters and the plot of everyone chasing a silly little orb around the galaxy are where Guardians falters. By the second half, the story really drags down the entire production. A few seemingly easy fixes and this one could have been a classic.